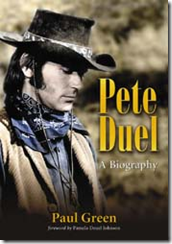 A biography of Pete Duel, born Peter E. Deuel on February 24,1940. Peter became an international TV star in the 1960’s and early 70’s and is best known for his starring role as Hannibal Heyes in the popular television series Alias Smith and Jones. He also had starring roles in Love on a Rooftop and TV’s Gidget series. The book is an extensive biography of his private and public life from the beginning all the way to his inopportune death at age 31 by suicide. It also includes more than 60 photographs and a complete anthology of Peter’s work. His plays, TV appearances, movie roles, and a complete guide to the TV episodes he appeared in. Some might be tempted to ask- why now? Why a book about Peter written 35 years after his death? Strangely enough, recent syndicated runs of Alias Smith and Jones on cable TV in the US, UK, and in Europe have propelled Peter’s fame back to near mythic levels. Surprisingly, there are ‘Pete Duel’ and ‘Alias Smith and Jones’ Websites to boot, including message boards and comment threads with hundreds of fans searching for every tidbit and everything about ‘Peter’ that might be available and then some. For example, one of the front doors to his childhood family home was recently bought by one of his endearing fans on eBay. The author, Paul Green, actually starts before Pete’s beginning with a look at his family heritage. This part was slow going and not near as interesting as his later life. One would hope for a few more insights into his childhood and family relationships. Most of the info. about his early life came from Pete’s sister Pamela with only a few childhood acquaintances. Pete’s college years and early adult life is much more complete with insights from several of his closest friends during that time. Peter’s reckless behavior and self destructive side begins to come to the forefront during this period of his life. Peter’s fast driving caused an early auto accident with injuries and pain that continued to plague him for the rest of his life. Peter moved to Hollywood in 1963 and launched his acting career in film and TV. He began with guest roles in a number of different TV series and game shows before being cast as the bother-in-law in TV’s Gidget starring Sally Field, which only lasted one season beginning in Sept.1965. Again, there were numerous guest roles and then a starring role opposite Judy Carne on Love on a Rooftop, which also ran for only one season starting in Sept.1966. Finally in 1971, after a number of TV movies and pilots, came the role that would end up defining his career. The role of Hannibal Heyes in Alias Smith and Jones, which he would star in until his untimely death in December 1971. After that, Roger Davis would pickup the role and finish the series. Paul Green fleshes in his personal life during his TV years with material from interviews with those who knew him best at the time. Those that he lived with, his loves and relationships like Beth Griswold, Kim Darby, and Dianne Ray. Those that he worked with like Harold Frizzell and long time friends like Davey Utter along side his sister Pamela Deuel Johnson who provided ongoing insights about Pete and his family. I found it particularly interesting that he was politically involved in the McCarthy presidential campaign and ended up in Chicago participating in the protests at the Democratic Convention in 1968. Later he ran for election to the board of the Screen Actors Guild in 1971 and lost. Both of these experiences ended up being a negative for Peter and some friends believe that those losses somehow took away all of his remaining hope for the future. Paul Green spends an entire chapter on Peter’s death by suicide. The material is quite detailed but it is the aftermath which is most interesting to me. Those who kill themselves do not appreciate how devastating it is to those who are left behind. My real interest in the book stems from the suicide itself. When someone ‘rich and famous’ kills themselves, we always wonder why. How could someone like that with fame and a promising future end it all? We look at our own lives in comparison and shake our heads in complete utter disbelief. Was it really all so bad compared to those of us stuck in 9-5 tedious jobs with no future to speak of, hoping against hope that ‘Social Security’ will be there when we’re old? Paul Green does not write conclusively about what caused Peter to commit suicide, nor can he. Peter didn’t leave a note or any detailed correspondence indicating his reasons. Though Peter did mention to several of his closest friends that he wanted to end it all. The writer does supply a number of possible contributing factors in the words of those who really did know him. Alcohol and drugs seem to top everyone’s list in addition to Pete’s storied self destructive dark side which obviously came into play. Most view the suicide as an accident that probably would not have happened if Peter was sober and not in a depressed state brought on by alcohol and pills. For me, the best part of the book was the ‘Testimony’ chapter where many of his closest friends were able to reflect upon their own feeling and reactions to Peter’s life and death after all these years. It is a study in those who are left behind to pick up the pieces of their lives when one decides to end it all. A valuable lesson for all who think that suicide is the easiest way out. « -Star Wars: Legacy of the Force: "Fury"